Geordie leaned over the horse’s neck and grasped the coarse mane with both his hands. Emily leaned with him, staying as tight to him as she could with her arms wrapped around him in a tight bear hug. As he dug his heels into the horse’s side, Emily closed her eyes. They were off. After a while, Emily glanced at her surroundings. Wisps of trees and clouds sped by as they cantered along. She clenched her teeth to keep them from rattling in her head. She loosened her fingers from their white-knuckle grip, but kept her arms clasped around his thin body. But she never relaxed the whole time. When they arrived at the stone house, she slid off the horse gratefully and almost collapsed on the ground. Geordie laughed at her. She straightened herself up, pushing her hair away from her face. Somewhere along the way, she’d lost her hair band. “I will,” she called up to him. He saluted her. Then he spun the horse around and headed back across the pasture at a trot, his red hair flying back against the wind. 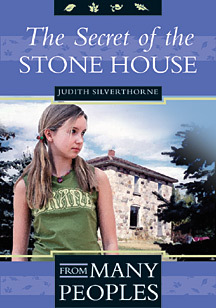 When she’d straightened up, Emily sprinted for the stone house. She eyed the back door, her mind whirring with the possibility of going inside. She wouldn’t really be breaking and entering. She lived there, after all. She just wanted a quick peek to see if they’d done more work on the fireplace. Cautiously, she mounted the plank stairway and opened the door. On tiptoes, as if afraid to disturb anyone or anything, she made her way into the parlour. She dropped to her knees in front of the unfinished fireplace and studied the construction. The stone chimney was partially finished and the hearth was all but done. She saw the rock that needed to come out to reveal the hiding place, but it took some time to figure out how the contraption worked to move it. At last, she rested on her heels and smiled. She knew the answer. No time to lose. She had to return home! She slipped outside and made sure to close the door properly. She knelt at the house foundation. Without hesitation, she placed the carving into its hole and found herself crouched in the flowerbed behind her grandmother’s house. Agnes Barkley stood above her, shrieking. Although dazed, Emily jumped to her feet. She took a quick look around. There were just the two of them. And neither of them was bleeding as far as she could tell. By then, some of the nearby auction-goers rushed around the side of the house. Among them was Emily’s mom. “What’s all the commotion?” Kate asked, going first to Agnes Barkley side. Mrs. Barkley shook from head to toe and her jowls wagged as she pointed speechlessly at Emily. Kate turned to Emily. Aunt Liz appeared with a glass of water and handed it to Mrs. Barkley, who downed it in one solid gulp that left her gasping. A few people stayed, but most of the small crowd disappeared again when they didn’t see anything amiss. “And you scared the living daylights of me,” rebuked Emily, trying to prepare a plausible explanation. “But she did,” Mrs. Barkley insisted, her double chins trembling with emotion. “Emily, what did you do?” her mom demanded. “Fell into the flowerbed,” Emily said, as truthfully as she could manage. Aunt Liz looked from Emily to the flowerbed to the step and back again. She had a queer look on her face, but she said nothing. “What were you doing back here anyway?” asked her mom. “Me scaring her!” Emily muttered to herself, but then she caught sight of the glare in her mom’s eyes. She apologized contritely. One of the other ladies, Eunice Henderson, guided Agnes Barkley back to the front of the house. “I’ll get to the bottom of this,” Kate warned Emily.